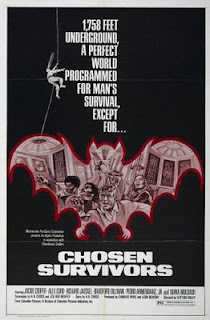 Tag line: "1,758 Feet Underground, A Perfect World Programmed For Man's Survival, Except For..."
Chosen Survivors gets off to a confusing start, which is exactly what the filmmakers were shooting for. Ten people, heavily drugged, are rushed off a military helicopter towards an elevator built into the side of a mountain. They barely notice as they're placed inside, and stand silently as it carries them downward, to a depth we assume is hundreds of feet below the surface. It's clear these people have been thrown into the middle of something they don't understand, and like them, we have to wait patiently for an explanation. The elevator leads to a futuristic bunker, where a television monitor plays a prerecorded message welcoming them to “the greatest adventure” of their lives. It seems the United States has become embroiled in a thermonuclear war, and these ten were selected by computer, based on their knowledge and expertise, to eventually rebuild the world above, which is in the process of being destroyed. The survivors, including ecology expert Carrie Draper (Gwenn Mitchell), Olympic Gold Medalist Woody Russo (Lincoln Kilpatrick), and corporate executive Raymond Couzins (Jackie Cooper), are greeted by Major Gordon Ellis (Richard Jaeckel), who's been living inside the bunker for some time, preparing it for just such an emergency. With their world gone, these men and women must band together and make the best of a difficult situation. But if the end of civilization weren't enough to shake their spirit, the discovery their bunker's infested with vampire bats might do the trick! After the opening sequence, which offers plenty of sharp camera angles and slow-motion (putting us in a similar state of mind as the drugged survivors), we see, by way of satellite images, how the war is effecting the earth's surface. The entire atmosphere is engulfed in flames, melting the South Pole and heating the Pacific Ocean to its boiling point. Then, before anyone has a chance to let this bit of tragedy sink in, the vampire bats make their presence known. Now, maybe close-up images of snarling bats aren't enough to scare you, but they sure start my skin to crawling! With so much danger and misery hitting us at one time, it's fair to say Chosen Survivors is far from an uplifting film. It is, however, a fascinating one. The movie does falter a bit in its character development, and despite its impressive cast, we never really get to know any of them well enough to understand their motivations (with the exception of Jackie Cooper's executive, who doesn't buy for a minute that the world has ended, believing the whole ordeal is a government-sponsored test). What's more, some of the effects are, even by '70s standards, on the clunky side. But not to worry; there's plenty of sci-fi gadgetry, not to mention hundreds of killer bats, to keep you entertained, and though it stumbles on occasion, Chosen Survivors is never, ever boring. Sounds actually, on paper, as quite a good film. The dynamic between the different 'leaders'. I wonder what the women would feel, how quickly things would turn uncivllissed?. You would hope for the best at least. It was certainly entertaining. Not perfect, but on the whole, a good watch. And with the situation they're in, things get uncivilized pretty quickly! I have actually never heard of this one, though it sounds right up my alley.